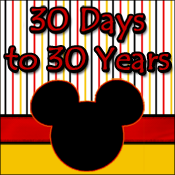 Epcot will have their 30th anniversary on Monday October 1st - and to celebrate, DisTherapy is doing a retrospective of each of Epcot's years. Today's post looks at the year 1986 - and was written by yours truly. It is full of teen angst. Sore feet. High school best friends. Glasses. Braces. And some 80s hair. Oh - and of course - memories of my day at Epcot when I was 16. Come by and say hello! So...what about you? When was your first trip to Epcot? My first trip was in 2008. Loved it. I'm trying to remember when my first trip to Epcot was. I had to be about 10, which would've been 1985. I need to see if my parents have any pictures from back then. That would be fabulous!